Dallas – Fort Worth will have a regal look today as The King of Tooro (Uganda); H.R.M. Oyo Nyimba Kabamba Iguru Rukidi IV makes his first visit to the Metroplex in Texas. The King will also visit Tarrant County College -Trinity River Campus located in Down Town Fort Worth this coming Monday July12, 2010 at 03:30 pm. King Oyo is the reigning Omukama of Tooro, in Uganda. He was born on 16 April 1992 to King Patrick David Kaboyo Olimi III and Queen best Kemigisa Kaboyo. 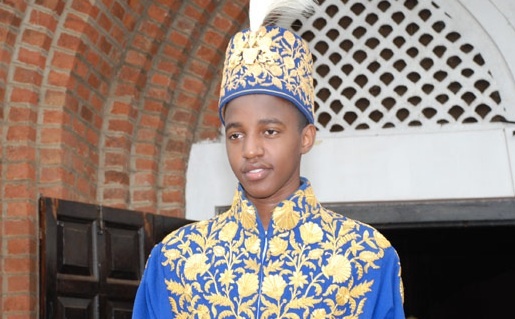 Three and half years later in 1995, Oyo ascended the throne and succeeded his father to become the 12th ruler of the 180 years old Kingdom of Tooro. He is currently the youngest ruling monarch and went down in the Guinness Book of records. Tooro with its capital Fort Portal lies in the south western part of present day Uganda. The people of Tooro make up 3.2 percent of the population of Uganda which stands currently at 32 million. The Kingdom is ruled by the Babiito dynasty whose origins go as far back as the 14th century. According to oral history, Prince Olimi Kaboyo Kasunsunkwanzi, son of Agutamba Nyamutukura Kyebambe III, King of Bunyoro succeeded the southern part of his father’s Kingdom in 1822 and founded what is known as Tooro today. Oyo Nyimba is referred to as the Omukama which means King and Rukirabasaija, the greatest of men. 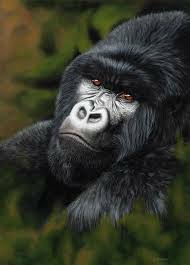 Although he is considered the sovereign leader of the Batooro, Oyo Nyimba’s power is limited to cultural duties. The untimely repose of his father King Kaboyo in 1995 meant the Crown Prince had to take his place as king during his toddler years. On the 12th September 1995, a week after his father’s burial, Oyo ascended to the throne. To help him rule, King had three regents charged with grooming and overseeing his growth into the role of King. The regents handled the affairs of the Kingdom until Oyo turned 18. He has ruled alongside regents for the last 15 years. 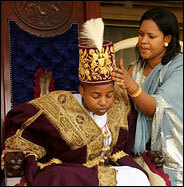 Upon turning 18 years on April 16, 2010, King Oyo assumed full control of the affairs of his Tooro Kingdom. One of the main duties of the King is to Lobby for donations, for economic and social welfare projects for the well-being of his subjects. 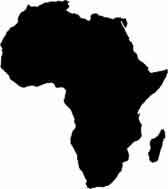 These include health, education, economic and cultural projects. The latter is important to build the people’s confidence in the King and promote strong cultural identity. Supported by his regents and family, Oyo travels the world seeking foreign assistance for the development of Tooro. Most recently, Oyo received 100 wheelchairs on behalf of the Kingdom which were distributed to five regions of Tooro. Other humanitarian projects are endorsed by the Kingdom through the King Foundation of Tooro which runs a special education fund for needy children. The Tooro Kingdom Women association helps to boost the economic well-being of women in the kingdom by supporting and promoting small scale generating projects. All banquet proceeds will go toward the Kingdom’s charity and development projects. This entry was posted in Diaspora on July 10, 2010 by Administrator.